Today in fierce news, Disney released a new doll ahead of the Beauty and the Beast live-action movie. 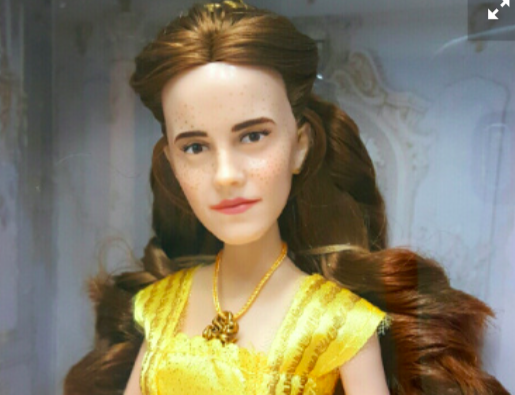 The doll is supposed to be Emma Watson as Belle. Thing is, it looks nothing like her. Naturally, the lack of resemblance sent the Internet into an uproar. Most agreed that the doll, with its oval-shaped head and strange freckles, looks more like Justin Bieber in a wig and ballgown. That’s when Mark Jonathan, the artist known for his RuPaul’s Drag Race-inspired Barbie repaints, came to the rescue. He gave the Belle doll a much-needed makeover. Unfortunately, his doll isn’t actually on the market, so we have to be satisfied with his Instagram images. Watch Jonathan’s stunning reveal video below to see a doll worthy of the gorgeous Emma Watson. Let’s look at the original doll, for comparison. For further comparison, checkout the new trailer that recently came out for Beauty and the Beast. The clip shows some footage that we’ve already seen in previous trailers, but it features Emma Watson singing. And a lot of her beautiful visage. Beauty and the Beast will be Watson’s first major musical film. We can’t freaking wait.